Marietta is sitting in her living room when she gets a call from Tammy. Tammy: Marietta! Glad you answered! I think you need to turn on CNC. Marietta: Why? I’m watching House Hunters! Tammy: Spoiler alert: they already bought the house! None of what you’re watching is real. Marietta: Well now you’ve just ruined my fun. Tammy: Good. Turn the news on! Tammy: You’ll see. I gotta go. I don’t want to be on the phone when you find out. Marietta: I can’t believe she just hung up on me! I guess I better - HOLY S***! Marietta is staring at her TV, which she has turned to CNC. Sarah Pratt: If you’re just joining us on this special hour of the Spin Zone, allow us to fill you in on some news. Dan Freberg: CNC has exclusively learned that Amy Applewhite, New Orleans city councilor, is running for mayor of New Orleans. Sarah Pratt: Thanks for cutting me off, Dan. Dan Anything for you, Sarah. Sarah: Back to the news, Applewhite announced her candidacy today with a rousing speech that harshly criticized frontrunner and former US Senator Marietta Landfield. Dan: That’s right, and sources at CNC state that the Landfield campaign is already in panic over the announcement. Marietta: Not true! That’s fake news! Marietta turns the TV back to House Hunters. Marietta: I gotta get my attention off of this for awhile. This should do the trick. Might as well check my phone while the commercials are on, though. Marietta picks up her phone and notices over 30 messages and missed calls. Marietta starts listening to the messages. Martin: Patty Lynn, where’s the peanut butter? Patty Lynn: It’s in the pantry, Martin. That’s where it always is. Martin: I looked in there. It wasn’t there. Patty Lynn: Oh. We must be out of it, then. Martin: Well what am I going to do with this bread with jelly on it? Patty Lynn: Throw it away! Eat it! I don’t care. Martin: I’ll just eat it. Marietta: God, that was painful. I guess I should call her. Marietta calls up Patty Lynn to see what she wanted, after a five hour House Hunters marathon. Patty Lynn: Marietta! I’ve been trying to contact you all morning! Marietta: I know. Oh boy do I know. Unrelated question: did you buy any peanut butter recently? Patty Lynn: Actually, I did. How did you know? Marietta: The message. The incredibly long and painful message. Patty Lynn: Oh, I’m sorry dear! You know your father. Always doing crazy things! Marietta: Oh yes. Dad’s the one that does that. For sure. Patty Lynn: Anyway, I was calling to tell you that Amy Applewhite announced her mayoral candidacy today! Patty Lynn: Well, why didn’t you call me? Marietta: I’ve been doing very important things. Patty Lynn: What about real estate? Marietta: I’ve been… umm… I’ve been speaking with real estate agents. Trying to get the endorsement of the Real Estate Union. Patty Lynn: Aww, that’s nice. I’m glad you’ve been doing something important. I was worried you were just relaxing. Patty Lynn: I guess I should go and let you get some more endorsements! Marietta: Alright, bye mom! I love you! Patty Lynn: Love you too, sweetie! Marietta hangs up and hears a frantic knock at her door. Marietta opens her front door to find Tammy standing there, drenched in sweat. Marietta: What happened to you? Tammy: I couldn’t get an Uber, so I ran here. 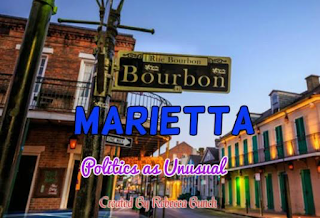 Marietta: From the French Quarter? Tammy: It’s not that long of a drive, so I figured that it wouldn’t be that bad to walk here. I was wrong. Can I please have a glass of water? Marietta: Sure. Here ya go. Tammy: Thank you. If you hadn’t answered, I was fully prepared to call a priest to administer my last rites. Marietta: You aren’t even Catholic. Tammy: I know. That’s how desperate I was! Marietta: Well that didn’t make sense. Tammy: It did to me at the time. I think I may have had a heat stroke out there, I really don’t know. Marietta: Anyways, what was so important that you needed to sprint here to tell me? Tammy: Oh, that! Alright, so you know how Amy Applewhite is running for mayor? Marietta: Again with the Amy Applewhite! Tammy: This is very important! Tammy: I just got this poll back. Maria told me that she ordered it immediately after the announcement. Marietta: Get on with it! Tammy: You fell below 50% Marietta. Tammy: 80%? Yes, you were. Marietta: Ouch. What is it now? Tammy: You might not want to know. Marietta: My goodness gracious! Can we trust this poll? Marietta: So they’ve been right one out of five times. Very reliable. Marietta: It’s time to run the ads. Marietta: The ones I told you to create. Y’know, after the Olympics party. After dad told me about Amy’s candidacy. Tammy: Yeah, one small problem. Didn’t make ‘em. Marietta: Calling Milton. He’ll know what to do. Tammy: He’s not a miracle worker! He can’t just randomly fix this. Marietta: Well he can help me make an effective counter ad. Marietta: You forgot to even make an ad. My apologies if I’m not confident in your ability to make a good one. Tammy, laying things on a bit thick: WAHHH!!!!! Marietta: What’s wrong with you? Did I break you? Tammy, between fake sobs: I guess… I should… go home… and watch… Scandal. Marietta: Oh Tammy, don’t be sad. Maybe we can work on the ad together. Tammy: Really? Do ya mean it? Marietta: I’ll call him so he knows we’re coming and then we should head over to his place. Marietta dials the phone and calls Milton. Marietta: Hey Milton. What is the awful noise in the background? Marietta: What is that noise? Milton: No, I don’t have a pet koi. Milton: It’s like you’re just speaking nonsense. There’s construction going on and I can barely hear. I’ll try my best though. Marietta: Alright, well I’ll make this quick. Me and Tammy were wondering if you could help us create an ad. Milton: What’s wrong with dad? Marietta: Nothing is wrong with dad. I said ad! Milton: Yeah, what about him? Is he okay? Milton: Mairetta, I’m so confused? Is there something going on? Did dad have a heart attack? I told him he shouldn’t eat so much butter! Marietta: Dad is fine! We want you to help with an ad! Tammy: Milton! This is Tammy! 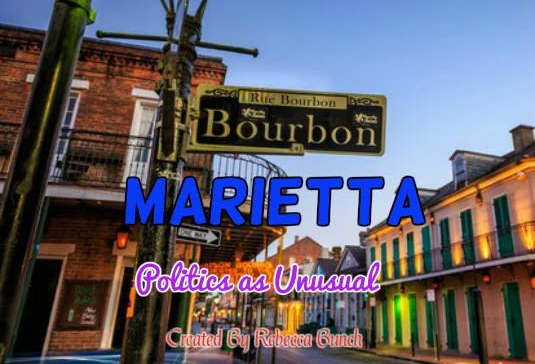 We need help making an ad for Marietta’s campaign? Milton: What does dad have to do with Marietta’s campaign? Tammy: Oh my god! I said ad! Milton: You need to stop saying dad! If there’s something wrong, tell me! Marietta grabs the phone back. Marietta hangs up and throws the phone. Marietta: I can’t stand these things today! Tammy: What the hell did you do that for? Marietta: Believe me. Milton needed that. He’ll be over in like five minutes. There is a knock at Marietta’s door. Marietta answers. Milton: I can’t believe dad left mom! What happened? Marietta: He didn’t leave her. I just needed you to come over and I wasn’t getting through. Milton: That’s awful! How could you do that to me? Marietta: Well you’re here aren’t you?